Penguin Books. Pages 285, Rs 299. Every life is full of stories that are waiting to be told. It is these beads that come together to form the string of life. Some are your own, some are inspirations, some are imaginations and others are formed from here and there, but each of them is required to complete the whole. Stories transport you to thither land, make you think, move you, and ignite a plethora of emotions within you. 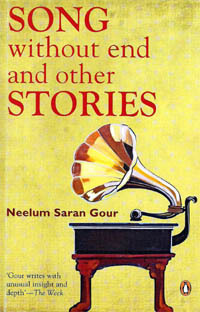 Author Neelum Saran Gour has put together an imaginative collection of stories that beckon you to keep the pages turning. She is the author of four novels and two collections of short stories. Her work is included in several anthologies. She teaches English at the University of Allahabad. She has also edited a volume on the history and culture of Allahabad and translated her work into Hindustani. This collection spans 30 years, from 1981 to 2011. There is variety in the themes of the stories, their pace changes but they merge beautifully into one book. Among the 15 stories that make up this book, each one shines through in its own right. The story that lends its name to the book, Song without end, revolves around the camaraderie between a doctor and a patient in a small town. Both are seen pushing the limits of their friendship in unique ways. In Play, the author shows the struggle between the actors for the meatiest roles and the effects of the characters that they play on the screen in their day-to-day life. The line sometimes blurs a bit too much and tests the actors to their wits' end. The Taste of Almonds presents before the reader a senile Nawab who has lived past his days of glory and is craving a slice of his former days. The irony here is that though his situation is that of a pauper, those who are not any better off than himself show magnanimity and make him feel like a Nawab once again. Friendships are not defined by the length of time that you spend together but by what you put into them. Winter Companions is about one such friendship that defies logic and makes one want to believe that friendship knows no bounds. Pretty Woman reassures one that all that glitters is not gold. First impressions can lead you astray. A New Year's Party deals with the limited choices lonely elderly people are faced with in the fast-paced and individualist culture of today. Other titles in this collection are Connectivity, Goddess of Clay, Honourable Mention, The Second Attack, Grey pigeon, Major Event, Coming of Age, Through the Looking Glass and A Lane in Lucknow. They talk about themes as varied as connecting in the digital age to giving up on a bit of fame for someone more deserving. A sculptor is rotting in penury but is not ready to succumb to commercialisation of his trade, which he believes brings him closer to God, even though he remains oblivious to the tribulations of his family. A hopeless optimist who is not cowed down by anything, a poet who is ready to give up his place in the spotlight for his prot`E9g`E9e and someone on the verge of losing his eyesight who finds it hard to be without books.